HOW TO GET A HOLD OF THE BEST ROOFING CONTRACTOR AND SOUNDPROOFING INSTALLATION COMPANY IN AKRON, OHIO. ​There are many reasons for soundproofing your business or home. Go Pitch Perfect can take care of any reason you may have for soundproofing a building in and around Akron, Ohio. Everyday we are exposed to a multitude of low to high frequency noises. Outdoor noises that come from traffic, airplanes, dogs, people, machinery can often be an annoyance or distraction if we are in our office working or at home trying to have a quiet moment to ourselves. Even indoor noise from ventilating systems, telephones and conversations in the workplace can be a distraction and make the workplace less productive. There are other reasons for soundproofing as well- lets say you just installed a home theater system in your home and every time you watch a movie you are getting calls from the neighbor to turn it down. Soundproofing can solve that problem. Your kid and his friends wanted to start a band and they are using your garage for band practice. Soundproofing can solve this problem. What about a big or small corporation who needs a productive workplace for the management team and has a call center at the heart of the building? Soundproofing can solve this problem. What about a research company that needs a quiet atmosphere for research purposes. Soundproofing can solve this problem. There are so many reason why residential and commercial buildings need an affordable sound proofing option. Go Pitch Perfect can soundproof for any residential home or commercial property. We have access to a wide variety of sound proofing and noise control materials to block sound, isolate sound, and absorb sound. 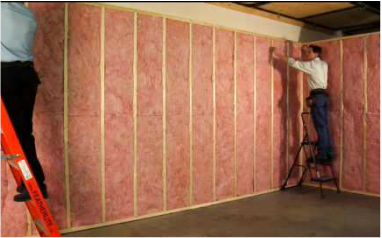 Here is a list of places you can often find soundproofing for noise reduction has been done. There are many other places that you may find soundproofing has been done. If you are thinking about soundproofing anything from a single room to a complete building give Go Pitch Perfect a call or fill out the FREE no obligation contact form.